Radha says to Chanakya that we should investigate about poison, Chanakya says we dont have much time, the killer will try to attack again, we have to stop him/her, Radha says we dont know about killer, how will we catch him, Chanakya ask what is the easiest way to give poison to anyone? Radha says to mix it in food, Chanakya says keep eye in kitchen send your secret agents and ask them to taste food, my secret agent Yashesvri is in kitchen too, Radha goes to kitchen, Chanakya sit down and says Ashok have become prince now only and attacks have started from now only, till reaching throne, what would happen to Ashok. Ashok is with Ahenkara, Ahenkara says that atleast by killing my mother and father, you became prince, Ashok says if you wanna kill me then you can but dont kill me with your bitter words, if i can do anything then i will, Ahenkara says why you care for me so much? 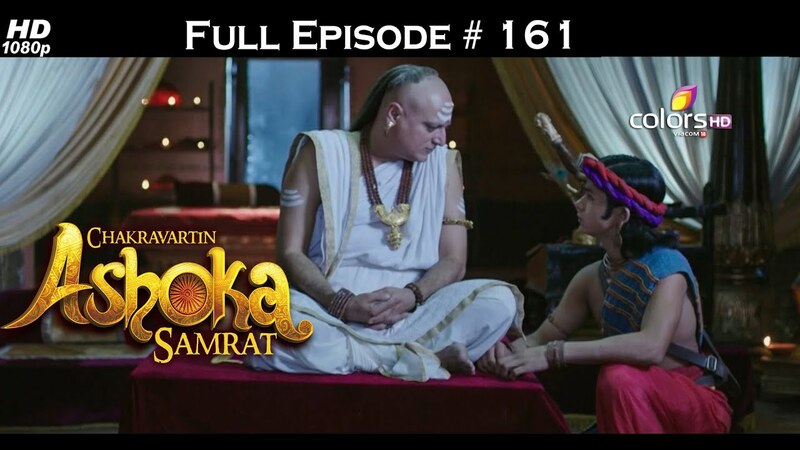 Ashok says you are my friend and your problems are my problems, Ahenkara says only this is reason? Ashok says whatever happened in your life, it is somewhat related to me, your mother died and i was one of the reason too so if you want anything from me then tell me, Ahenkara says anything? he says yes, Ahenkara gets emotional and looks away, Ashok says you are worried regarding Sushim, she says nothing like that, he turns her face towards him and says if you dont tell me then how will i solve your problem, Ahenkara looks at him and hugs him emotionally, Sushim comes there and sees them hugging, he comes in angrily and pulls away Ashok, he punches Ashok, Ashok falls down, he gets up, Sushim says how dare you touch my would be wife, Ashok says nothing like that, Sushim says i saw it with my eyes, Ahenkara says you are thinking wrong, Sushim says this means you gave your hand by will, i am seeing that from the time you know Ashok is prince, you are trying to near him, Ashok says you cant allege her like this, Sushim says you want me to be silent after seeing all this, this Ahenkara wants to get rid of me so thats why going close to Ashok and also Ashok will marry a princess thats why going close to Ahenkara, he says to Ahenkara that dont forget i am doing favor on you by marrying you, you are living on my expense, Ashok says everyone has right to dream, Sushim ask him to leave from here, Ashok says this is Ahenkara’s room, you have no right to be here like this, Ahenkara says i dont want to become reason of fight between two brothers, you both leave from here, Ashok says to Sushim that you are my brother but dont test my patience so much that i will forget it too, he leaves from there, Sushim says to Ahenkara that if you try to tell anyone that you dont wanna marry me then you will lose your brother too like your parents, he brings out knife and is about to kill Ahenkara’s brother, she says no, i wont say anything to anyone, dont hurt him, Sushim says thats like a good wife, he leaves. Dharma says to Bindu that i used to cook food for royal family when i was Sevika and now i am part of royal family so i want to cook food for my family, Bindu says why no, he ask Kasturi to do arrangements in kitchen, Bindu says you are getting along with my family nicely, Ashok comes there, Bindu ask him to come in, he ask Ashok why you are in anger? did something happened? Ashok says yes and we have to give attention to it else her life will be destroyed, she doesnt want to marry Sushim, she didnt tell me but she said that her mother was using it, Bindu says i understand that but Charu told me that Sushim and Ahenkara loves each other, when i announced their marriage, Ahenkara seemed happy, Ashok says maybe she was acting, Dharma recalls how Sushim was misbehaving with Ahenkara, Dharma says to Bindu that we should talk about this matter as you also dont wan a loveless life for Sushim, Bindu says you are right, he ask soldier to call Sushim in court. Sushim comes in hir room and throws away things, Charu comes and ask what are you doing, Sushim says i agreed to marry her but i cant bear insult anymore, Charu says did she insult you? Sushim says Ahenkara gives more importance to Ashok than me, i have warned her, Charu says you are mad, nothing will happen by warning her as if Ashok tells anything to Bindu about your behavior then your dream of becoming Samrat will break too, before Ahenkara reaches Bindu, i have to talk to her. Ahenkara, Ashok are with Dharma and Bindu, Bindu ask Ahenkara to tell everything clearly, Dharma says you dont need to be afraid, its about your life, Bindu says that i promised your father that i will protect you, if you dont want this marriage then tell me, AShok ask her to speak up, Ahenkara says you people have accepted your enemy’s daughter and has given right to become your daughter in law, i wont be able to payback your debts, there was a time when i loved Sushim but now.. Charu and Sushim comes there with Ahenkara’s brother, Charu says that Sushim told me if i want to find Ahenkara then i have to find Ashok first, your friendship is amazing, Sushim points at knife, Ahenkara gets afraid, Charu says your brother was crying so i thought find you, Sushim says Ahenkara is busy talking to Bindu, i will take care of her brother as he is my responsibility too, he takes brother in his hands and acts like he slipped from hsi hands but he holds him in time, Dharma ask him to be careful, when you take responsibility, you have to fulfill it, Charu says what you are trying to say that my son is not capable of taking up responsibilities? Dharma says nothing like that, Charu ask Ahenkara to complete her talk, Ahenkara says to Bindu that there was a time when i and Sushim used to love each other but after flammable palace incident, our relation got strained, Sushim was angry with me and he alleged me too for that conspiracy, i started believing that Sushim doesnt love me anymore but it was my misunderstanding only, Sushim smirks, Ashok angrily looks at Sushim. PRECAP- The mysterious girl mixes poison in Ashok’s dish, she says he wont even have time to ask water before dying, she gives poison mixed bowl to Ashok, Ashok says to dharma that its been many days since you have make me eat with your hands, feed me today, Dharma takes bowl from him and is about to feed him..